Rather than tell the pre-excavation story of the land, I have excavated a few hundred years of human history on one small slice of the University campus: what I lovingly have called “The Pit.” The story of the pit is one that begs to be told backwards, like a sediment core. The noise on weekdays: banging, shouting, and purring from various engines that power the pit and its workers. The fence and detouring path: tattered by wind and snow, rerouting the sidewalk to bring new asphalt. Just as our Paleolithic ancestors chipped at stone to make certain shapes, the men in this pit chip at an artificial stone—concrete—to make a new shape in the topography of the flattened surface behind the library. And so I start this story from the surface. Simply put, concrete is the result of crushing limestone into a fine powder, heating in in a kiln to detach carbon and add hydrogen into its molecular structure, and binding it with cement. This process sounds innocuous enough, but in Europe alone, the production of concrete accounted for 38.5% of the entire continent’s carbon dioxide emissions in 2009. Each ton of concrete produced releases one ton of carbon dioxide into the atmosphere. The simplicity of this ratio should make concrete one of the most easily communicated emitters. In fact, it is often overlooked or forgotten in the carbon emissions conversation, where we instead like to blame ugly giants like coal-fired power plants or this country’s swelling fleet of automobiles. In addition to the chemical consequences of concrete production (and this does not account for the processes of transporting and laying the concrete, which adds even more emissions to the equation), it disrupts landscapes and ecosystems and contaminates the air and water both during and after construction. It literally caps the earth, forcing life to its cracks and margins, making the surface hotter and harder. In the Pit, the concrete is an upper layer, a crust like the earth’s, and must be broken before the digging can begin. Once the machines and the men have cut through this layer, the real excavation can proceed. The soil of this site is so disordered that it’s almost impossible to tell its story. It takes a long time to make dirt. Though it depends on many unfathomable and inarticulable factors, geologists claim it takes a minimum of a century to create one inch of topsoil. Dirt is a culmination of nearly all of Earth’s processes: solid rock, flowing water, volcanism, air, creeping biota from all kingdoms. It is as elemental as it is essential, crafted one particle at a time by a thousand hands working in tandem, deposited incrementally in telling arrangements and patterns. Dirt is life, and life is dirt. There is no telling the story of humanity without telling the story of dirt, nor is there any telling the story of my Pit without the story of the dirt. In an 1899 survey of the soils of Salt Lake Valley, Frank Gardner and John Stewart write, somewhat poetically, that the dirt of the valley was “brought down from the mountain sides and [formed] by sediments from the ancient Lake Bonneville.” From this survey, a local, somewhat rudimentary taxonomy of soils was born (by 1974, this list would be expanded to at least 73 variants). Mostly deriving from their location and texture, these names are confusing and not at all distinct. In the Salt Lake Valley, Gardner and Stewart identify the following eight soil types: Jordan sandy loam, Bingham gravelly loam, Jordan loam, Jordan clay and clay loam, Jordan meadows, Jordan sand, Bingham stony loam, and Salt Lake Sand. These soils often interact with and overlay each other, creating an infinite number of possibilities in soil horizons as the bores drill deeper. Many of these soil combinations are infertile, due either to aridity or saltiness, though some, like Jordan sandy loam, have modest agricultural potential. The tragedy of these soils is, of course, that in my Pit, they are nearly indistinguishable. The dirt has been churned, emptied, and filled so many times that any attempt to identify strata or horizons would be fruitless. 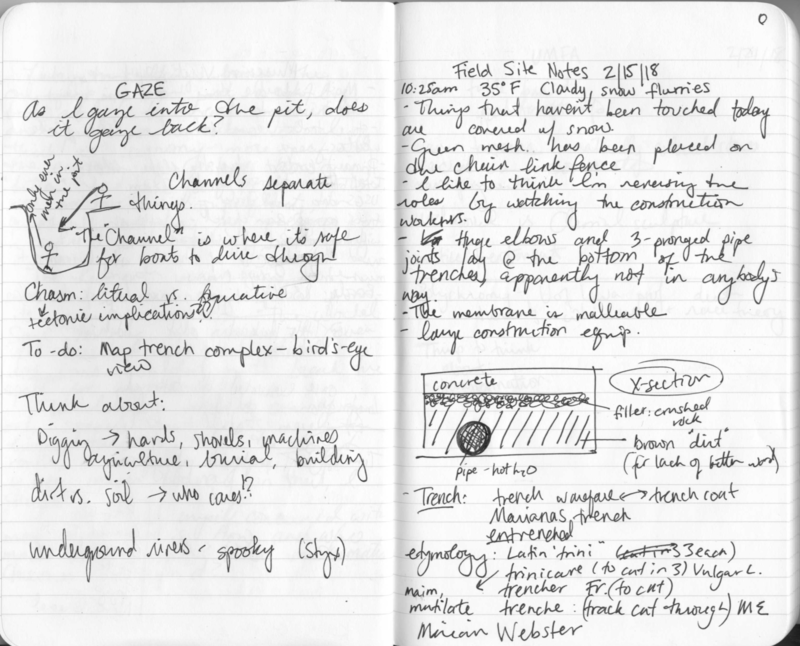 The installation of underground water lines draws more meaning to the pit (and this essay). Recent research suggests that these pipes aren’t by any means abiotic; hot water pipes are now known to be the perfect homes for “opportunistic human pathogens” like those responsible for tuberculosis and legionnaire’s disease (noted in the text is of course that these pathogens are usually harmless, except under a few very specific circumstances). And it’s not just pipes that we have condemned to the underworld. Naturally-occurring rivers are often relegated beneath cities to improve urban layouts. In Salt Lake City, many creeks and streams run beneath the surface alongside sewers and natural gas lines. 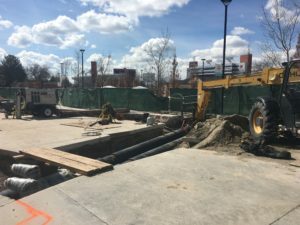 The purpose of the Pit is to retrofit hot water lines to “meet demand for load capacity.” Academic campuses, in my experience, are constantly under construction. 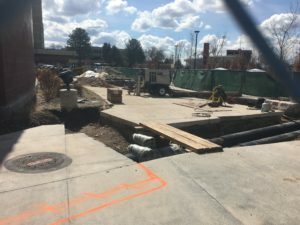 Every campus I have ever lived or worked on, whether for four years or just a summer, has had some very large, very intrusive construction happening on its main campus. Something is always being updated, upgraded, replaced, torn down, remodeled, re-shaped, mutilated or restored. When one project ends, another begins. The only exception to this rule thus far has been one week every May, during which my undergraduate institution would mercifully halt construction while families and loved ones were in town for graduation. So again, we’re re-working a slab of pavement behind a library for the purposes of progress. According to the University, these pipes will last fifty years. In the eyes of a dean, that’s a long time. A lot can happen in half a century. But for the dirt that’s only enough time, best case scenario, to grow by half an inch, and even that’s unlikely given the site’s alienation from the key growth factors for soil: climate, organisms, relief, parent material, and time. Most of these factors have been removed at this site, which has been sterilized so that all of these variables may be controlled for (and not injure the high-temperature water lines). We move things like water, gas, and sometimes electricity underground because they would interfere, we say, too greatly with our lives if they were allowed to participate in what I will call the “superterranean.” This argument makes sense; power lines are less likely to go down in snowstorms if they are underground; water and gas pipelines would take up far too much space on campuses and city grids. Just as we have passively forgotten where these things come from, so have we intentionally forgotten their route to us. So the water moves within the soil, just as an artery might move within a tissue. The fluid is well confined, encased to prevent leaks, buried beneath the skin, and forgotten. It is only when the case breaks that we must open the wound again. Cohen, Jeffrey. “Geophilia, or The Love of Stone.” Continent 4/2 (2015): 8–18. Daib, Ahmed M., Elmoaty, Abd, and Aly, Ayman. “Long Term Study of Mechanical Properties, Durability and Environmental Impact of Limestone Cement Concrete.” Alexandria Engineering Journal 55 (2016): 1465–82. Douglas, Mary. Purity and Danger: An Analysis of the Concepts of Pollution and Taboo. London: Ark Paperbacks, 1966. Gardner, Frank D., and John Stewart. “A Soil Survey in Salt Lake Valley, Utah.” National Resources Conservation Service, 1899. www.nrcs.usda.gov. Geravandi, Sahar, Afshin Takdastan, and Elahe Zallaghi. “Noise Pollution and Health Effects.” Jundishapur Journal of Health Sciences 7/1 (2015).